Making Change at Walmart (MCAW) recently uncovered documents which show that the retail giant knowingly sold their old store location in Brownsville, Texas, for $4.5 million in 2016 to a company that would likely lease the building to be used as a child immigrant detention center. 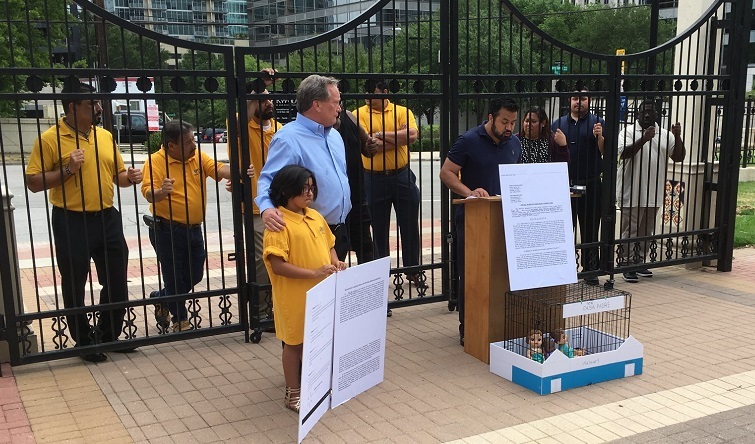 MCAW, along with Latino groups and allies, held actions in Chicago, Dallas and San Diego on June 20 to protest the retail giant after the documents were uncovered. Walmart recently claimed they “had no idea” their store “would go on to be used in such a disturbing way,” but documents prove that a company known for detaining immigrant children was named in the sales deed as the financial lender in the sales transaction. 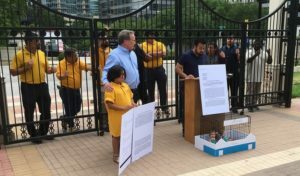 “Instead of preventing its old location from being used as a child detainment center, Walmart saw this as an opportunity to make a profit at the expense of children,” said MCAW communications director Amy Ritter.